Feeling a bit better so Sunday I went for a walk around the yard. My intention was a longer walk but after a few images reaching and bending well the pain took over. Six weeks since my Pain Clinic was closed and the State keeps putting out misinformation. Go to the ER they say but the Dr. at the ER says “I don’t know why they told you this it is against State and Federal Regulations for us to treat chronic pain.” But it sounded good in the press which is all any state agency can hope for. MBA’s make medical decisions and appease the residents of Wa. that they are doing something for poor patients. 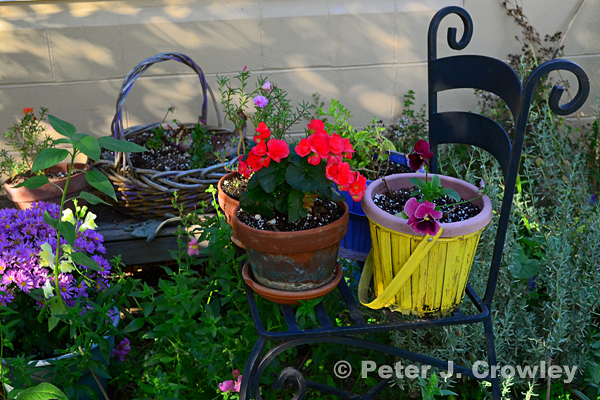 Patty’s plants a visual stimulus just down the walk. 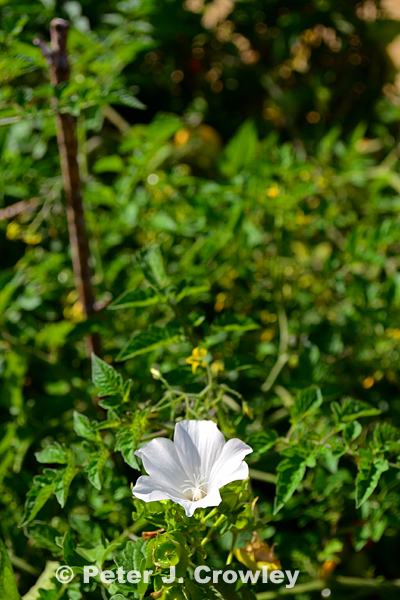 A White flower amidst the tomatoes shines as fruit ripens for a salad and many quarts of sauce just outside my door. A KGP garden from Grub.